Are strawberry leaves poisonous to humans, or are wild strawberries edible--answers to strawberry edibility questions can be found here. Many people make herbal tea with fresh, just-picked, undamaged strawberry leaves, or with strawberry leaves that have dried out completely over several weeks. In doing so, they seem to suffer no ill effects. However, like all the other plants in the rose family (Rosaceae), the leaves of strawberry plants release hydrogen cyanide gas in the early weeks of their decay process. Hydrogen cyanide (HCN) is a very deadly poison. As a result, strawberry leaves during this period of decay are extremely toxic and must not be consumed in any way. The fruit of wild strawberry plants is very definitely edible. In fact, many people feel that wild strawberries are actually much tastier! Wild strawberries are rather easy to identify, too: other than the fruit being smaller than that of their garden cousins, wild strawberries look just like that of the garden varieties. However, because wild strawberries are quite small, many more of them are typically required to have enough for various recipes. 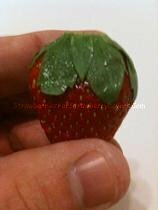 They also tend to spoil a bit faster than garden strawberries, since they have not been cultivated for shelf life as domesticated strawberries have been. If you are able to obtain some wild strawberries, it is recommended that you use them right away. It is only this extreme perishability of the wild strawberry fruit, as well as the unpredictability inherent in the cultivation of wild strawberry plants, that prevents wild strawberries from being more widely available in the marketplace.